Long warehouse, with high first storey, built of red brick with arches, pilaster-strips and window-margins in yellow brick. At west end is a 4-storey and loft block 7 bays wide, the bays being separated by pilaster-strips; Central bay has door at 2nd, 3rd, 4th, with hoist over. To East of this block is a 2-storey, 18-bay range; windows are grouped in recessed arches in 9 pairs each with gable over (containing circular window). To East of this range is another 4-storey, 7-bay block followed by another 2-storey range, 22 bays wide, windows grouped in 11 pairs, the E. end having 6 recessed arches. The gable-ends of the 4-storey blocks have 8 stepped recessed arches. 1995: The buildings are vacated. May 1997: A Listed Building Consent application to demolish is submitted. 3 June 1997: The Greenock Telegraph reports on the demolition threat, with feasibility studies estimating restoration at £18 million. 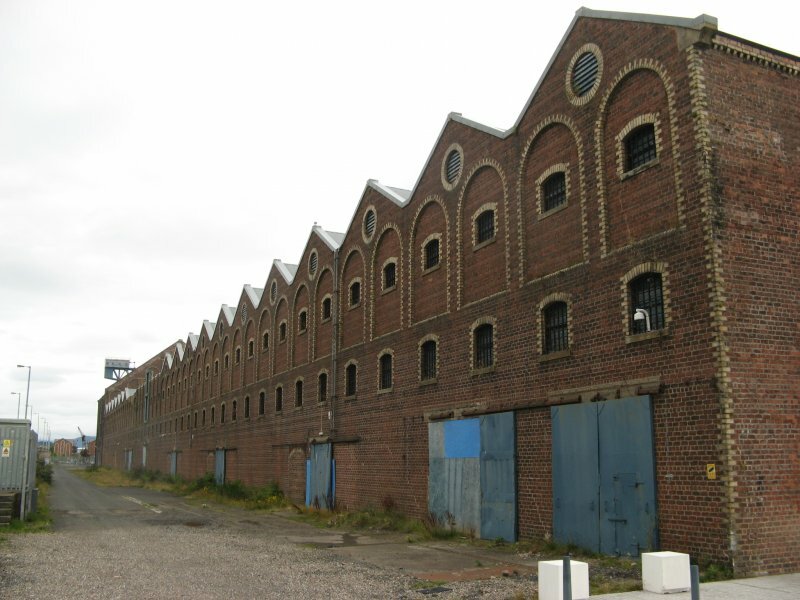 It is reported that Clydeport plc lodged the application to demolish after Renfrewshire Enterprise indicated it did not have the funds to restore the warehouses to a condition where they would become eligible for European grants or lottery funding. SCT strongly objects to the application, citing the fact that the warehouses are regarded as unique in the British Isles by accepted experts. 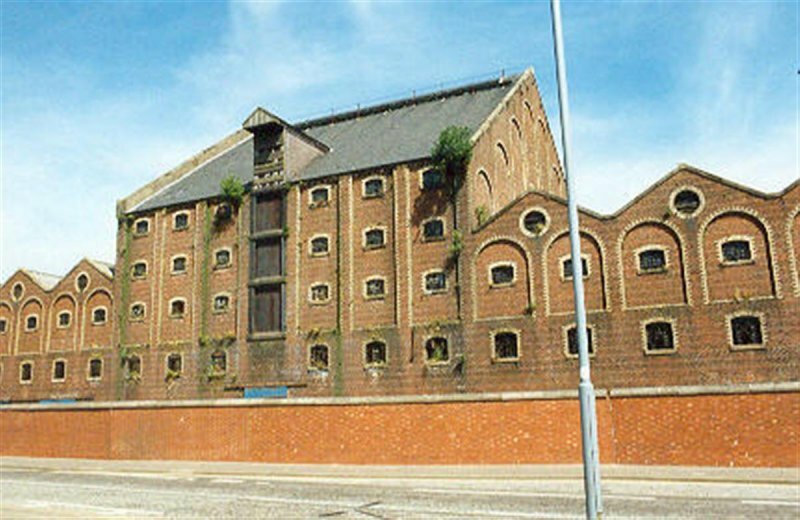 June 1997: Regeneration Through Heritage, established to aid local communities find new uses for industrial buildings, express an interest in visiting the warehouses to assess whether to add them to their list of pilot projects. 16 August 1997: The Greenock Telegraph reports that the granting of permission to demolish rests on Clydeport providing evidence of proper marketing. It is in discussions with local planners and Historic Scotland. 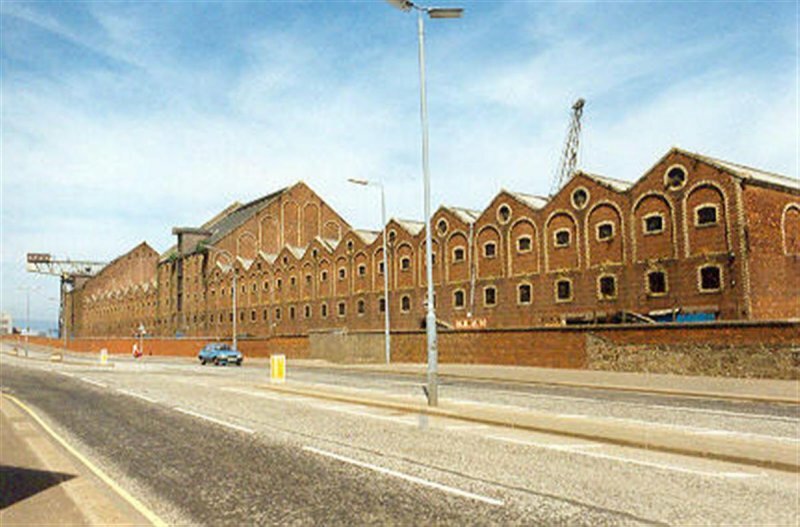 Clydeport is reported to regard the warehouses as a blight on the redevelopment of the James Watt dock into an enterprise zone. March 2000: No change reported. 20 June 2002: The Greenock Telegraph reports that Prince Charles, as president of the Phoenix Trust, is to visit the site. The Trust is reported to be interested in getting private developers involved in the site. 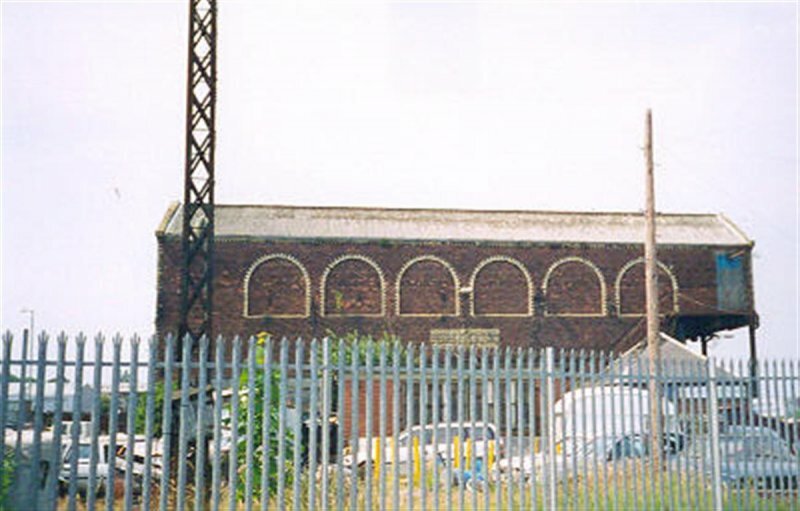 December 2002: SCT receives information that ARP Lorimer and Associates has been appointed to compile a feasibility study on the warehouse's reuse. 2002: The warehouses are included in the World Monuments Fund's bi-annual List of 100 Most Endangered Sites. May 2003: Local planners report that the feasibility study is ongoing. June 2006: The warehouse suffers from a devastating fire. June 2006: Greenock Telegraph reports that Inverclyde Council and Clydeport have confirmed the building will be partially demolished over the next few weeks to make it safe and to allow the retention of some historic features. September 2006: Historic Scotland report that the central sections have been demolished to make the property safe. April 2008: The Herald reports on a £3.7m deal to secure the future of the iconic building. 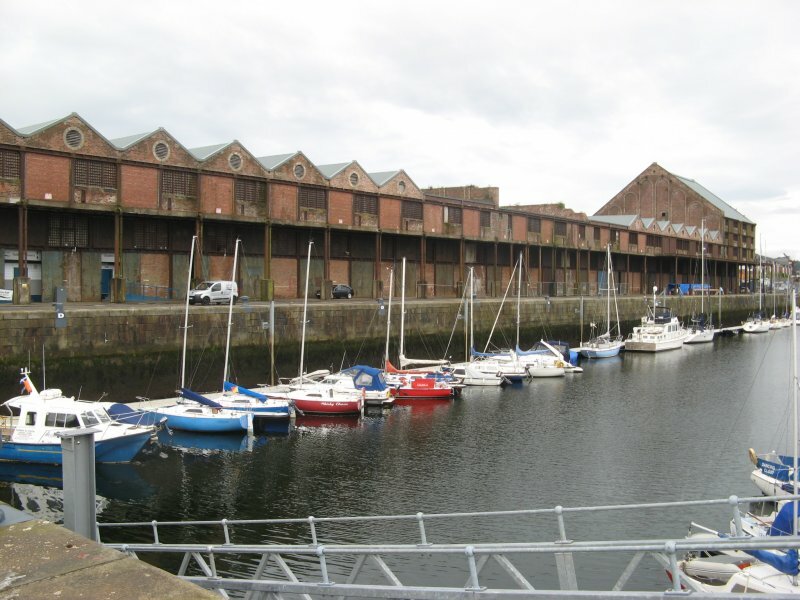 The funds are to carry out vital repairs to ensure the building is wind and water tight as part of a wider regeneration of the James Watt dock area supported by Historic Scotland and Inverclyde Council. Discussions are reported to be ongoing as to how the building can be redeveloped. FSP Architects, who were responsible for the redevelopment of Liverpools Albert Dock and Londons India Quay, have been approached to come up with plans. July 2008: The Greenock Telegraph repeats the story that a £3.7M deal to secure the buildng is in place. A mixed retail, leisure and residential development is eventually planned for the building. August 2008: Site visit by SCT Project officer confirms works have commenced. Set to Restoration In Progress. November 2008: Greenock Telegraph reports that a £180M deal which allows the regeneration works to James Watt Dock and the sugar refinery has been finalised with Riverside Inverclyde group. 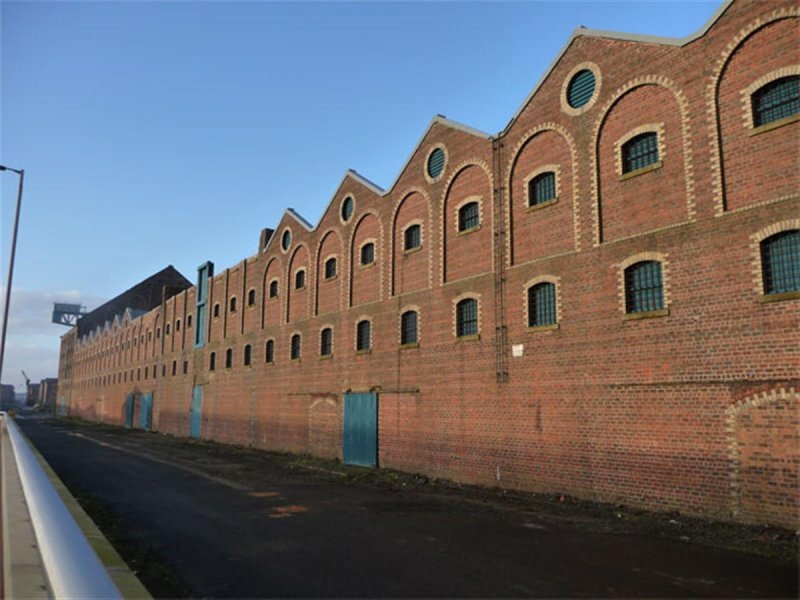 June 2009: The Greenock Telegraph reports on the project to make the Sugar Sheds, Scotlands largest surviving cast-iron and brick industrial building, wind and water tight, securing its long term future as the centrepiece of Riverside Inverclydes development of the dock. The article reports the project has gone to plan and is on target to complete by October. January 2010: The Scotsman reports on the masterplan which is to be lodged with Inverclyde Council including proposals for the Sugar Warehouses. BBC News website later reports that the plans have been approved in principle by Inverclyde Council. 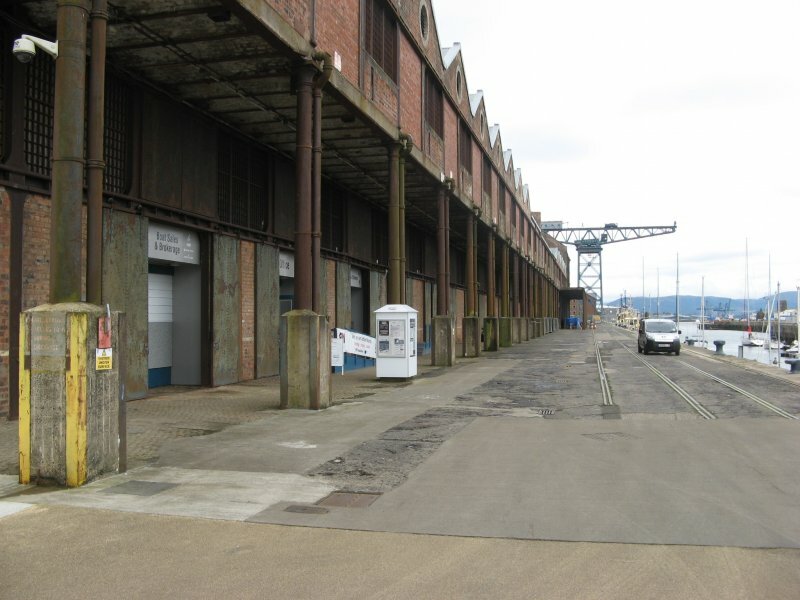 July 2010: Greenoch Telegraph reports developers Riverside Inverclyde and Clydeport have submitted an application to create a business park and ground floor cafe/ restaurant at the eastern end of the warehouse complex. The article goes on to note that existing plans are in plan for the creation of a new civic square next to the road, the renovation of a small Smith Rodney crane as a sculpture in the development. September 2010: Greenock Telegraph reports members of the Heritage Lottery Fund committee have visited various sites in Inverclyde, including the Sugar Sheds, to encourage new projects to apply for funding. Inverclyde has been identified as one of their priority areas as it has not submitted as many applications as other areas of Scotland. 14 August 2014: External inspection finds the building in much the same condition as seen previously. The remedial works noted previously were carried out following fire damage to preserve the structure for future full restoration. The former sugar warehouse remains in partial storage use. Planning Permission in Principle for a mixed use development for the James Watt Dock was conditionally approved Jan 2010 ref: 09/0182/IC. The masterplan outlined a phased development for the area to include hotel, marina, residential, retail and leisure use with the former sugar sheds proposed as retail/ leisure at ground floor with potential for residential use at upper level.